MON. – THU. : 9a.m. – 9p.m. Email here if you have a general course enquiry or any questions about a Short-term Study Visa. Email here about enrolment, cancellations, payments, refunds, if you have a holiday request or would like to get a Confirmation Letter or Course Certificate. Also, send your Student ID Card and 18+ Student Oyster Photocard requests. Email here to ask about course information, learning strategies, changing levels or if you would like us to design a Personalised Course Package for you. Email here if you want to know about Teaching and Learning Resources at Ingla. Email here if you are experiencing personal and emotional problems, need advice on living in the UK or advice on local facilities and services. Email here to find out about the Ingla Enrichment Programme, which includes social activities, trips & events and Ingla Experience Weeks. Email here if you have a question about accommodation or would like to make a booking. Email here regarding Ingla marketing, social media, publicity or if you are an agent and would like to work with us. Email here if you have concerns about your safety or would like to make a complaint about the school. 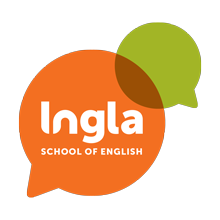 Email here to find out about vacancies and job opportunities at Ingla. Email here regarding building maintenance or if you are a subcontractor working with Ingla. Email us here regarding billing enquiries and credit control.